Enjoy your dream vacation in this magnificent beach home with spectacular ocean and sound views from every room. Cathedral ceilings adorn this spacious 4000+ sq ft. home! Stunningly decorated well-maintained. Comfortably accommodates 20-24 people while dining, sleeping or relaxing. Conveniently located to marina, shopping, Beach Club and golf. This is a great home for your fishing and golfing groups getaways from September through May! 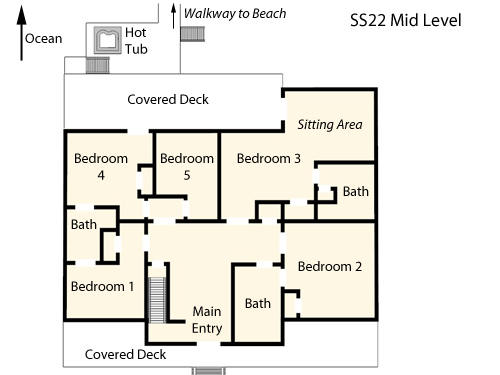 'Seaside 22' is a pet friendly 7 bedroom Oceanfront located in The Village at Nags Head. 9' x 16' private pool, oceanfront gazebo, hot tub, kitchen with double ovens, 2 dishwashers, 2 refrigerators, loft/study, WiFi, game table, 2 Master Suites; 1 with jet tub, 1 with a sitting room with mini kitchen (small refrigerator & microwave). 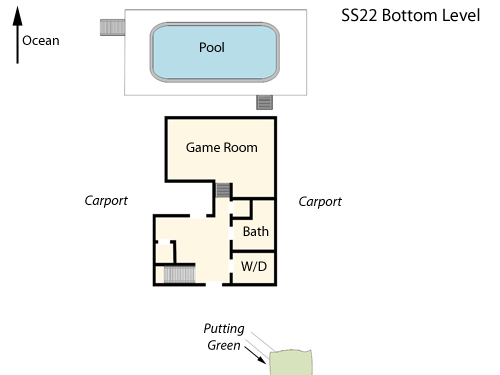 Pool table, wet bar & small refrigerator, 2 outside showers, fish cleaning table, 2 grills. Parking for 5-6 cars. Non-Smoking. Pets Allowed. Fireplace not available for guest use. Ask about our Military discount. This house is fantastic! It's got everything you'd want for an OBX vacation including close access to the beach, great decks, a pool, hot tub, pool table and putting green. The inside of the house is well furnished, recently updated, and very comfortable for our family. It's located on a very nice culdesac within a well kept community. We will definitely come back and stay! The house was well decorated and the kitchen had everything you needed for your stay. Loved having 2 refrigerators and dishwashers! The kids loved the little picnic table. The adults enjoyed the pool table and everyone had fun on the putting green! It was nice to have sheets and towels provided, even though the towels were a little rough. We had several maintenance issues, but they were handled quickly by Village Realty. The pool and hot tub were very clean and we enjoyed them everyday. There were no screens in the windows which was a bummer as we do not like air conditioning when the weather is nice and tons of bugs came in. Some of the deck furniture needed cushions to be used. The cushions that were there (not enough for all the chairs) were ripped up and need to be replaced. And we had some visitors on the walkway! Be careful, they are harmless, he was obeying the sign to stay off the dunes! We are enjoying our stay here very much. The house is wonderful. There are several items that need attention but I sent a small list to the realtor already. I'm sure they will be taken care of. We will be returning to this house in 2018! We just left SS 22 after a two week vacation. This was our 11th year in the same house. I do think it may be time for some updates on the furniture. The couches in the living room are getting very worn.There is a need for a new mattress on the middle floor in the room that has a small kitchenette. We were all disappointed that the lights that line the driveway we're not working this year. They're so nice to have to walk down the driveway in the evenings. That might be something that could get fixed. This house is not always the cleanest however this year we are not real sure it was cleaned very well at all. The floors were extremely dirty. There were no towels in the bath upstairs either one. We just grabbed towels from the bedrooms downstairs that weren't being used this year. We did have issues with the pool heater this year but the pool maintenance people were right on it. Got it fixed right away and double checked it. We're always very happy with the village realty people that we meet here. Linda, thank you so much for your review and we will take steps to insure better cleaning services on future stays. Your feedback is so important. It looks like you've already reserved your two week stay for 2018...we look forward to having you back again!! Seaside22 was a beautiful well decorated home. We had more than enough room for everyone. The extra fridge and dishwashers were a bonus. Easy access to the ocean. Plenty of parking. All attractions were close by. We have rented many times through Village Realty and will continue. We are never disappointed! As a matter of fact see you in September! Renting another condo this time. We came a week after hurricane Matthew. We are amazed at how resilient this community is. The house suffered a little during the storm, but was still very enjoyable. The house is in a wonderful location and the beach, hot tub and pool were perfect. The house is in need of updating and several things need replacing (furniture, appliances, deck cushions, mattress). This house is pet friendly. The house is not as clean as one would expect, I did not call or take pictures because I do not want my vacation to be spent with others in the house working on things or going around taking pictures. Property management should come visit and make their own punch list. 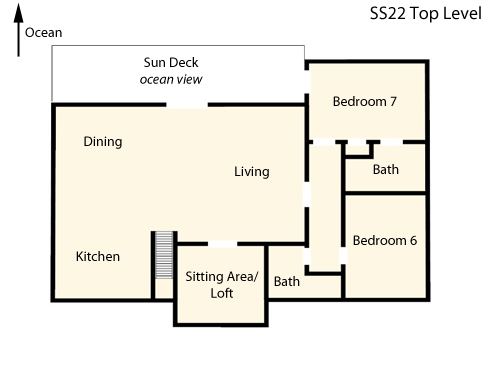 Would not rent this house again unless updated, remodeled - then we would love to return. House was very clean. Had a few minor issues during our stay. Were taken care of immediately. House met all our needs. Had 14 people during our stay and had plenty of room. Just steps to beach. Pool and hot tub were perfect. Great location. Lots in area to do and plenty of restaurants. Would definitely stay here again. The house was nice. Loved the area and location. The air conditioner came on and black soot flew everywhere. There were no pots to cook with. The cable channels were limited and not in HD. Thanks. Thank you for your feedback! We do restock the kitchen inventory as needed and reported to us, so thank you for making us aware of this need. We will have the HVAC checked and duct work cleaned as necessary as well. We are glad everyone enjoyed their stay and we hope to see you all back again soon!